Damascus, the capital city of Syria, has been inhabited for thousands of years. It is situated in a valley on the eastern plateau of the Anti-Lebanon Mountains, is watered by the Barada River, and in ancient times was at the convergence of many trade routes – all of which made it a rich and therefore desirable city. The Roman occupation (1st cent. BC – 4th cent. AD) is still visible in the many Roman ruins throughout the Old City. One of Jesus’s Apostles Paul, previously a persecutor of Christians, experienced his Christian conversion while travelling the ‘road to Damascus’. Hence the saying meaning ‘an important point in someone’s life with a great change, or reversal, of ideas or beliefs’. This guide map shows a route from Damascus to Homs in western Syria. 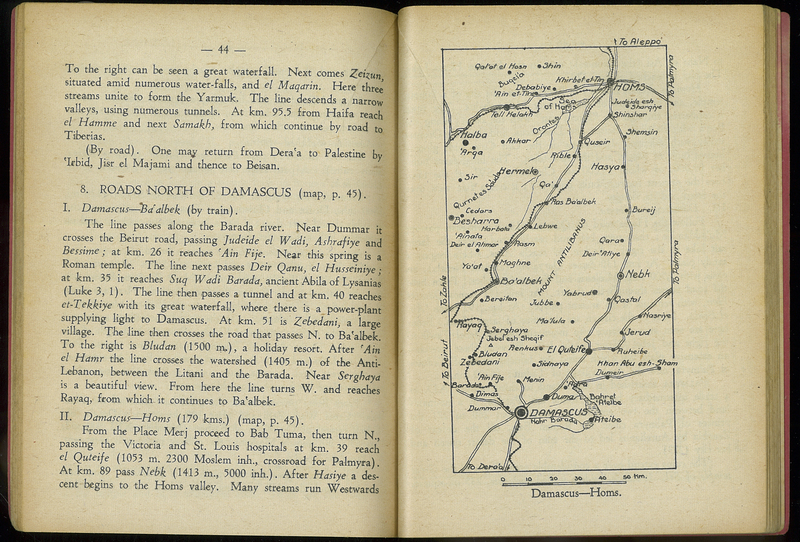 ___, “Steimatzky's Pocket Guide to Syria and the Lebanon,” ourheritage.ac.nz | OUR Heritage, accessed April 24, 2019, http://ourheritage.ac.nz/items/show/10794.